In this article we’ll explain some of the basic mistakes people make with instagram, and some basic tips on getting started to get people from Instagram to your website, and get them buying. Many of our clients sell antiques and antiques dealers frequently sell stock to other antiques dealers. 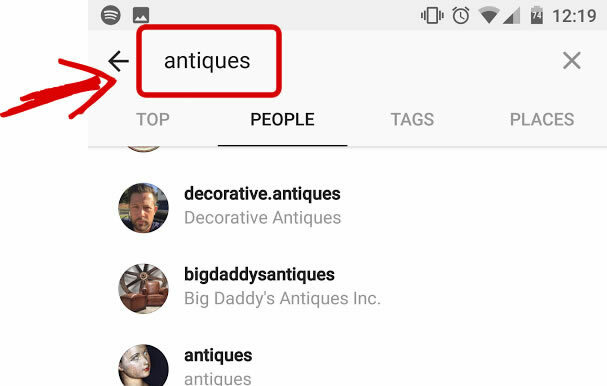 So a great way of getting more relevant followers is to search for “antiques” on instagram, and then click on “People”. Then click on people on the list, and follow them by clicking on the “Follow” button. This will mean you’re following them, but will also notify them and give them the opportunity to follow you back. You’ll usually find as a result the majority of people start following you back. Don’t follow too many people all at once as Instagram might think you’re a spammer. So follow a couple of dozen a day. An obvious one for some, but massively overlooked by others. Without using hash tags, the only people seeing your posts on Instagram will be those following you. However, if you use hash tags then this will help other instagram users discover your posts. For example, somebody looking for inspiration on antique tables might search on instagram for “antique table” or hash tag #antiquetable. A hash tag is simply added into the post title when posting a picture. All you need to do is use the # key on your keyboard, followed by the tag. As you type, Instagram will give you hash tag ideas, and tell you how many people are using those hash tags. 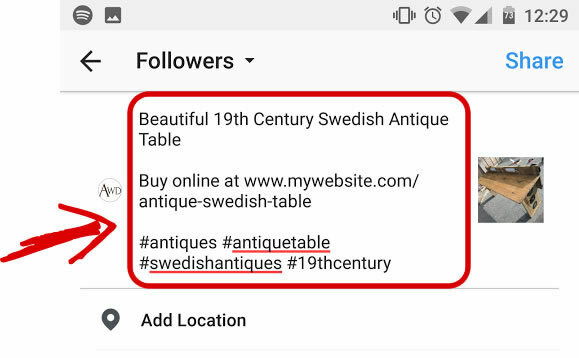 If the picture you’re posting is of an item to sell, be sure to include the web address to that item from your website in the post. This way people viewing the post will be able to click on the web address and buy the item from your website. Ensure that photos you take put focus on the item you’ve got for sale. Often we see people take very cluttered and busy pictures. With pictures like this, your eye doesn’t know what to look at; especially if you’re looking at the picture on a phone. So it’s really important to spend even just 5 minutes setting a photo up and “staging” before taking the photo. All a camera does is capture light. So with this if the lighting where you’re taking a picture is poor, then the overall quality of the picture may also be poor. So be sure to have as much decent light as possible when taking pictures.